Formal, attractive, durable vinyl doors come in so many colors that you can make your dreams come true. Unlike wooden replacement doors, vinyl color finishes are consistently matched to your decor on delivery. Vinyl doors don't split or crack, and you won't have to pay to repaint them year-after-year. In fact, the entire treatment with a decorative arch and molding cleans with a common garden hose and dish detergent. Six-panel doors are America's number-one choice among homeowners. Depending on the hardware you choose, this vinyl door makes for a solid replacement in modern, Colonial, European, and traditional homes. 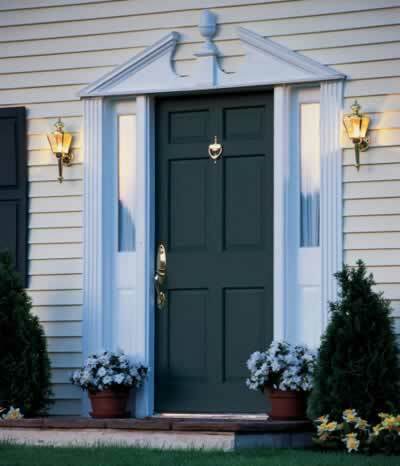 The matched latch, handle and knocker hardware lends curb appeal when installed on solid paint schemes. Add outdoor plants and period lighting to complete your entry. Did you know you can choose energy-saver vinyl doors that add value every month when you pay your utility bills?